Despite the fact that many around me think that I'm quite organized, the reality is that I only APPEAR to be organized because I've learned how to compensate by using systems that keep everything in order! 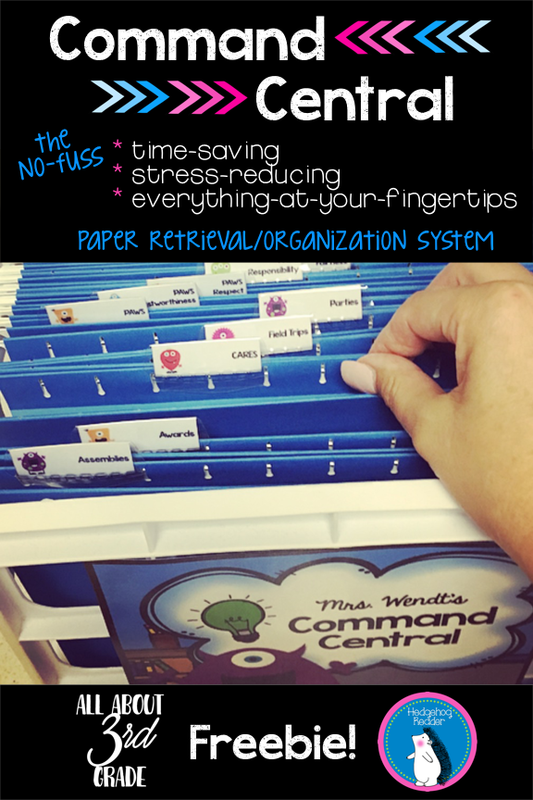 The whole point of the Command Central crate is to keep things at your fingertips without having to weed through piles, drawers, totes, computer files, and cupboards. If that sounds like an exaggeration to you, then you are probably one of those naturally organized types! On more than one occasion, I seriously searched in ALL of those places - and sometimes still came up empty handed despite my best efforts! Assemblies - seating charts, schedules, etc. Awards - awards that have been given or are coming up, as well as award coupons. Field Trips - protocol, forms, ideas, parent volunteers, etc. Parties - notes, volunteer info, etc. PAWS - In our school, we give die-cut paws to students who demonstrate excellence in the Pillars of Character. In my main PAWS folder, I keep the forms as well as a checklist to keep track of who has been awarded. I also have a separate folder for each pillar - trustworthiness, respect, responsibility, fairness, caring, and citizenship - so that I have quick access to the paws as needed. Permission Slips - I keep permission slips clipped together here for various purposes. One could create a separate folder for each bunch, but I haven't had to do that yet. Receipts - I keep any school-related expenses noted here (hopefully with a receipt!) until I'm ready to take it home for tax purposes. This is also a good place to have receipts ready to turn in for reimbursement from administration or PTO. Technology - Computer Lab schedules, instructions from our tech support, student passwords on a roster, etc. Testing - Calendar, special instructions, student modifications, etc. Other - Pretty much any system I have has the "other" option! This is where I put anything that doesn't have another place to go, but that is important enough to hang onto! I've uploaded a freebie for you here! It includes both the crate signs and the file tab labels in two versions - the Book Bunny that I used last year, and the Friendly Monster that I've created for my monster-themed classroom this year - as well as helpful hints on how to edit, print, and implement. This system has seriously saved me hours - if not totaled up to days - of time, not to mention that calm that comes with knowing exactly where to go for what we need! I hope that you find this useful too!